THE BIG, BAD BOOK OF BOTANY (William Morrow Trade Paperback Original; ISBN: 9780062282750; 8/5/14; $18.99) by Michael Largo, author of The Big, Bad Book of Beasts, God’s Lunatics, Genius and Heroin, and the Bram Stoker Award-winning Final Exits: The Illustrated Encyclopedia of How We Die, and more. A must-have (and must-see!) for trivia and nature enthusiasts alike, the book has just received a fantastic review by Library Journal and Kirkus Reviews, and pays lovely homage to our favorite floras. Complete with over 140 (gorgeous) original illustrations by the Tropical Botanic Artists Collective, here is an enlightening compendium of the world’s most amazing and bizarre plants from Absinthe to Kiwi and Licorice to Wasabi. Largo is available for interview, and can touch upon the history, facts and lore of their incredible diversity. Let us marvel at the plant kingdom’s many wonders! From the author of The Big, Bad Book of Beasts and Final Exits, THE BIG, BAD BOOK OF BOTANY: The World’s Most Fascinating Flora (William Morrow Trade Paperback Original; ISBN: 9780062282750; August 5, 2014; $18.99) is a one-of-a-kind compendium of the most fascinating plants, as well as their curious human history and lore. In a clever tone, author Michael Largo shares intriguing botanical secrets by revealing fact after astonishing fact about their benefits, and history, all while capturing their incredible diversity. Discover the folklore associated with plants around the globe from those so rare they were once more valuable than gold to those of ancient mythology—supposedly imbued with magical abilities like the power to turn a person to stone. Take a trip through the intriguing past and transformations vegetables and fruits have experienced over years of agricultural development, and learn of the journeys they take from farm to supermarket. 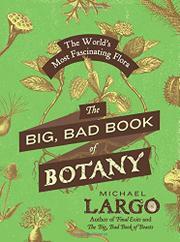 In The Big, Bad Book of Botany, Largo tells of plant recipes used by assassins to kill kings, and of botanical concoctions by sorcerers to revive the dead. He also recounts the amazing properties of certain plants to cure and heal—many of which have long since been forgotten by modern medicine. In a winning A-to-Z format and with over 140 original illustrations, The Big, Bad Book of Botany combines the latest in biological data with bizarre facts about the plant kingdom’s most unusual species, creating an expansive and endlessly captivating book that will forever transform the way readers look at the vast greenness of planet Earth. •	Although many believe coffee has been used since ancient times, the first documentable evidence that it was prepared as a beverage similar to what we drink today only dates to the fifteenth century. The monks at a Sufi monastery in Yemen instantly praised the first cup of hot coffee as a gift from Allah. •	Survival technique: if you break a leg or a bone in the wilderness, soak some birch bark until moist and you’ll find it makes a fairly sturdy temporary cast. •	The giant bamboo of China, which grows to 60 feet, is actually the tallest grass in the world. •	The familiar name lavender comes from the Old French word lavandre and Latin lavare (to wash), from its use as a soap and additive to baths since early antiquity. •	On October 12, 1492, in the Bahama Islands, the crew of Christopher Columbus’s ship brought reports of natives smoking dried tobacco leaves rolled in other leaves—the original cigar. •	Ancient Egyptians actually worshipped the onion, believing that its spherical shape symbolized eternal life! Michael Largo is the author of God’s Lunatics, Genius and Heroin, The Portable Obituary, the Bram Stoker Award-winning Final Exits: The Illustrated Encyclopedia of How We Die, and three novels. He is the former editor of New York Poetry and the researcher/archivist for the film company Allied Artists. He and his family live in Florida with their dog, two turtles, a parrot, two canaries, and a tank of fish.